I’m mostly posting this just so you can see an Elf Hat in action. 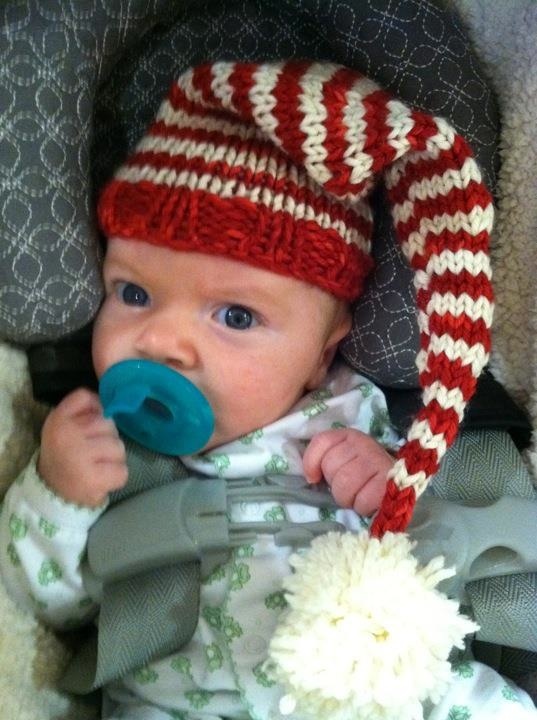 The lovely and talented Sarah was kind enough to don an elf hat on her infant son, Jackson, who is also a neighbor. She swung by last weekend during our football playoffs extravaganza (go NY, go SF). Sadly all the babies I knit this hat for grew out of it almost instantly, but Jackson got a photo in edgewise. Man, what’s cuter than babies at Christmas? Nothing. What’s creepier than naked Santas in a Finnish nightmare about the legend of Santa Claus, aka Rare Exports? 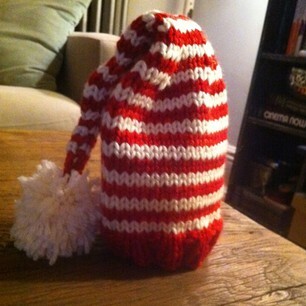 Me, crazy old lady, the only non-breeder in Park Slope, knitting things for my friends adorable childrens. Hopefully I’m not as creepy as him. Actually he’s not even Santa. But watch the movie, it’s adorably creepy and very Spielbergian. In the best way possible. In any case, I found a great pattern that inspired me to knit for the babies Ryan, Jackson, Barrett and Jacob. Best thing about knitting for babies? It takes about 2 seconds, or one long flight across the country or to another country (except eastern Canada). Actually, I take that back…I might have completed one to and from Toronto. How cute did this turn out? I got the yarn at Seaport, using hand dyed Malabrigo Silky Merino in Natural and Ravelry Red. I doubled the yarn to get the best effect and it worked great (I used size 7 round and DPNs as well). Cute as pie and fun. 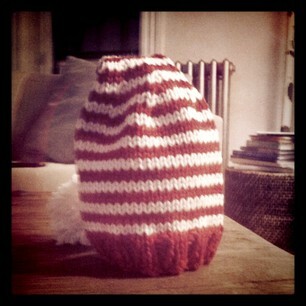 Will post some photos of the kids wearing them; the pattern comes in several sizes for several size baby craniums.